Chester Square was laid out as part of a largely intact planned development of houses and gardens on the Grosvenor Estate. 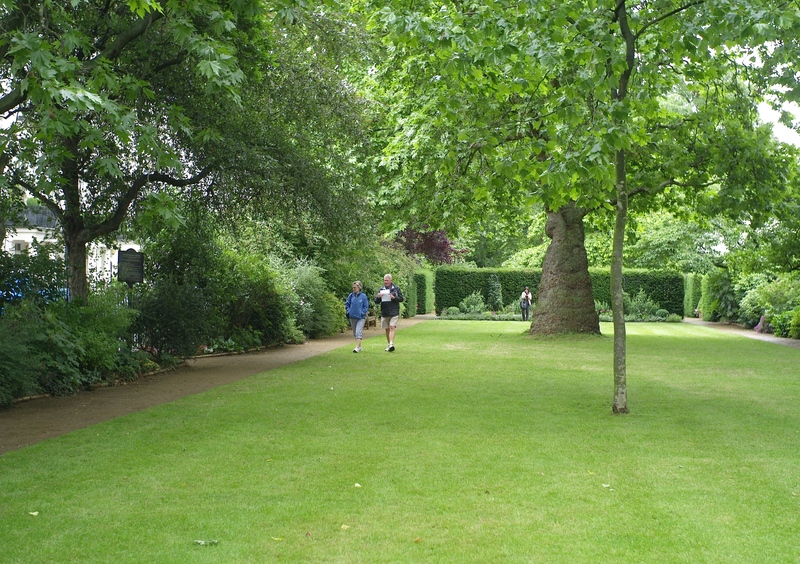 The private gardens of Chester Square originally consisted of three enclosures, but by the 1890s the central and south-western gardens had become one, separated from the north-eastern garden by Eccleston Street. Enclosed by cast-iron railings, the gardens have mature plane trees. The larger western garden was restored in 1997 to the layout shown in the OS Map of 1867. Rope edging tiles and some original trees survive, and the garden is planted with shrubs and herbaceous borders, and a central rose garden. Chester Square, Belgrave Square, Eaton Square and Wilton Crescent (q.q.v.) were on land formerly known as Five Fields on the Grosvenor Estate's holdings in Belgravia. In 1677 the family had acquired c.121 hectares of land of the Manor of Ebury, but this area remained undeveloped and largely used for market gardening until the early C19th, due to its predominantly marshy nature. In 1821 Lord Grosvenor, 1st Duke of Westminster, commissioned his surveyor, Thomas Cundy, to revise an earlier unexecuted scheme produced by Thomas or James Wyatt in c.1812, for draining and developing the site immediately to the north of John Nash's remodelled Buckingham Palace (q.v.). Cundy's plan, which added Wilton Crescent to the planned Belgrave and Eaton Squares, was completed in 1825 and building leases were then sold, with the main developer being Thomas Cubitt (1788-1855). The overall plan comprised a series of squares and crescents connected by a spine road on the main axis and a subsidiary axis. Under the original agreement, Lord Grosvenor was responsible for the enclosing and planting of the gardens but not for the considerable site works necessary before any planting could begin. Cubitt solved the problem of the marshy ground by bringing earth excavated from St Katharine's Dock near the Tower of London in order to raise the height of the ground. Belgrave Square was the first square to be laid out early in 1826, followed by Wilton Crescent in 1827. Eaton Square, also begun in 1827 was not completed until 1853. Chester Square was the fourth square to be laid out but although it was planned in 1828 it was not begun until 1835, an immense rectangular square in imitation of Eaton Square. Most of the palatial dwellings that overlook the central gardens are listed. St Michael's Church (1846) on the west side was designed by Thomas Cundy Junior. The gardens were originally three separate enclosures but the central and southern gardens were joined to form a single garden, with the north-east section remaining a separate enclosure to the east of Eccleston Street. The former roadway between the central and western gardens was marked by a formal garden hedged in yew. The railings, removed for the war effort, were reinstated in the 1970s. Among the former residents of the square were poet Matthew Arnold (1822-88) who lived at No. 2 Chester Square, and Mary Shelley (1797-1851) who lived at No. 24. The garden of Chester Square was highly commended in the 2011 London Gardens Society Competition.